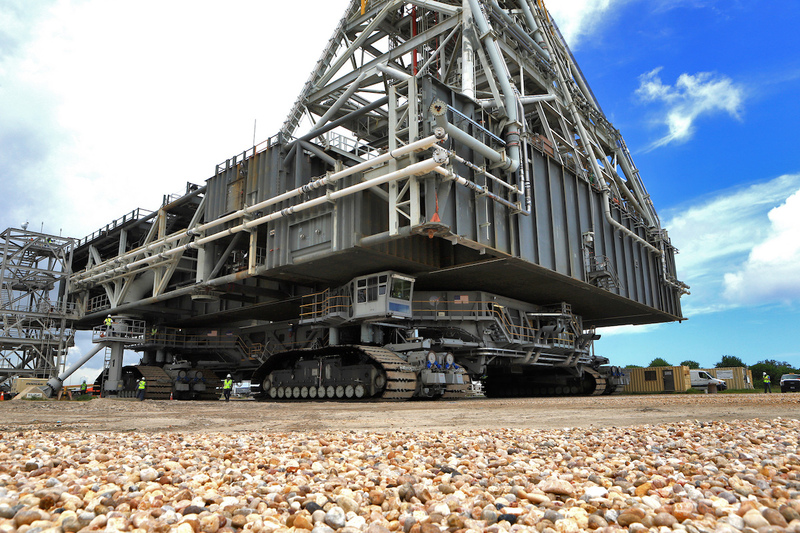 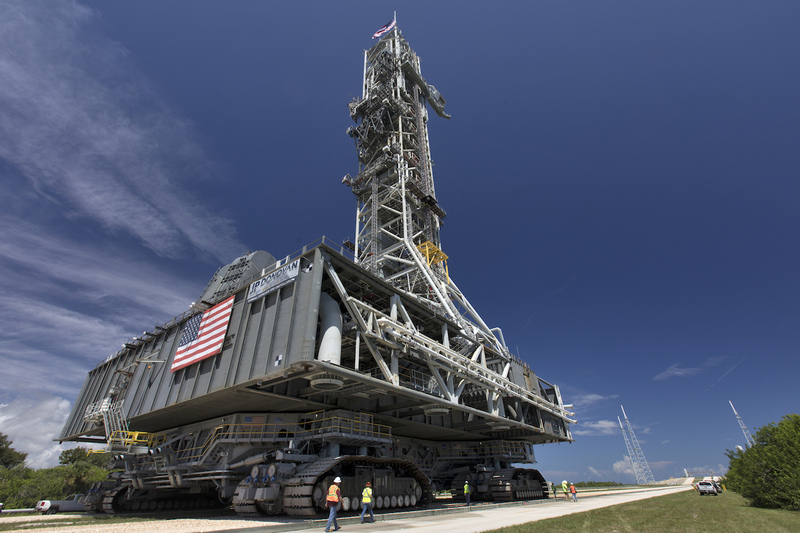 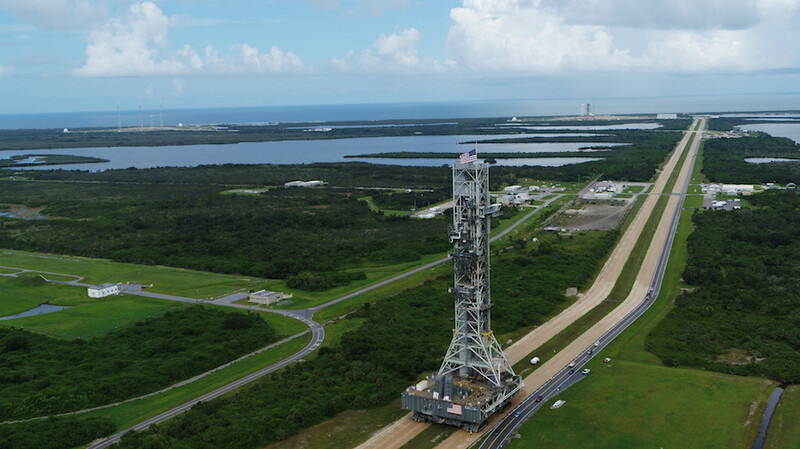 The nearly 400-foot-tall tower, riding one of NASA’s huge diesel-powered crawler-transporters, departed a position north of the Vehicle Assembly Building to pad 39B on Thursday afternoon. 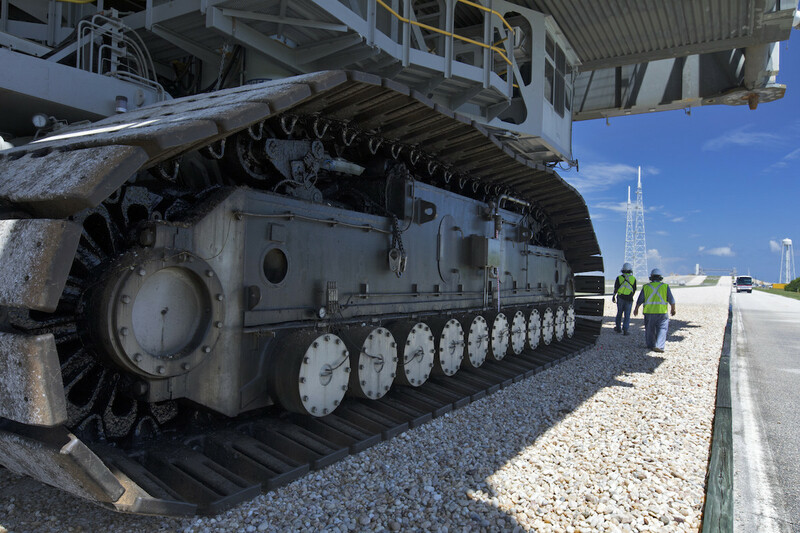 Running at an average speed of less than 1 mph, the crawler carried the mobile launch platform, specially designed for the SLS, along the same pathway covered in crushed river rock used by Saturn 5 moon rockets and space shuttles on their journeys to the launch pad. 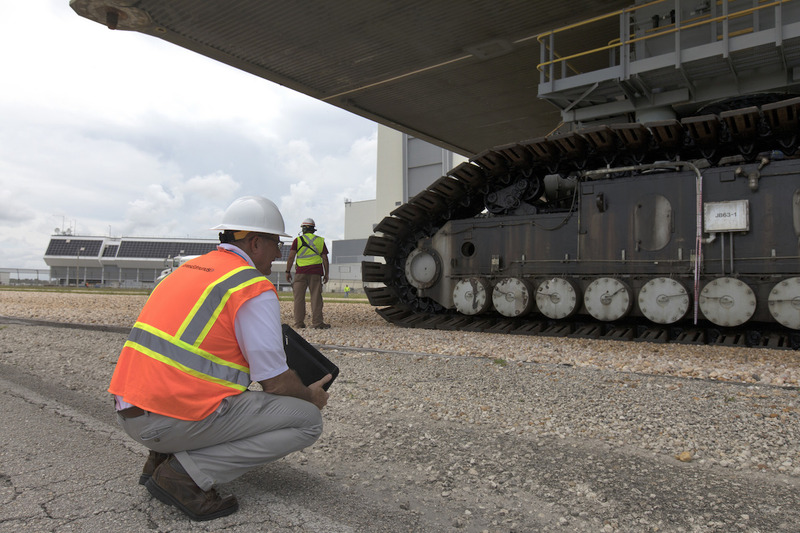 The crawler-transporter paused Thursday night along the crawlerway, as planned, then resumed the trip Friday, before arriving atop the ramp at pad 39B at conclusion of the 4.4-mile (7.1-kilometer) rollout. 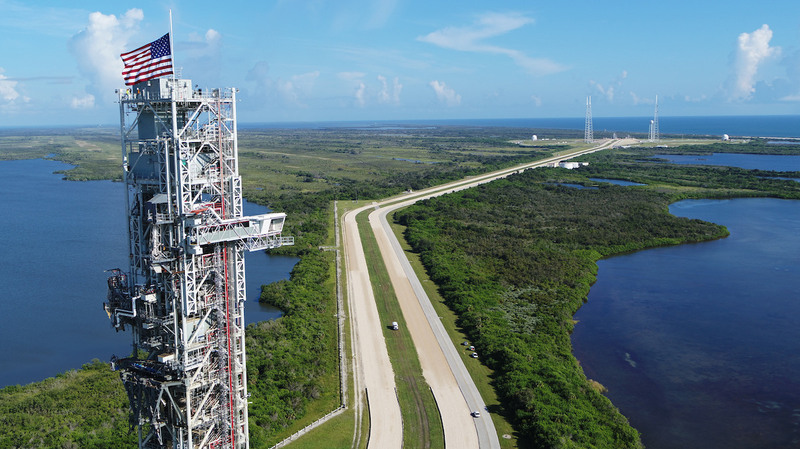 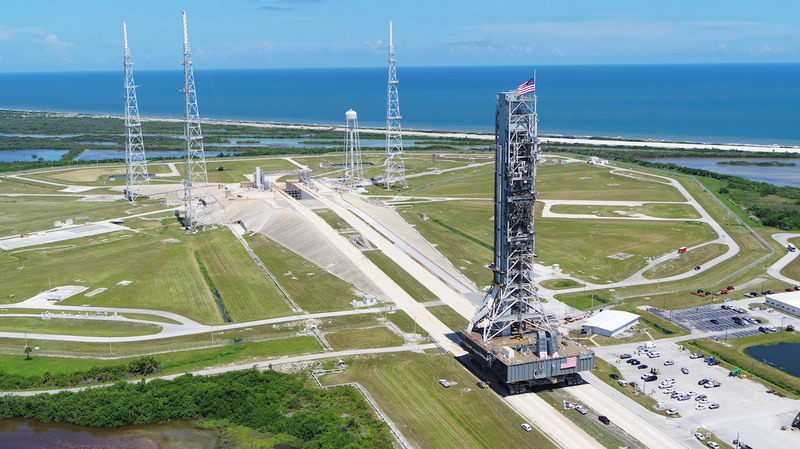 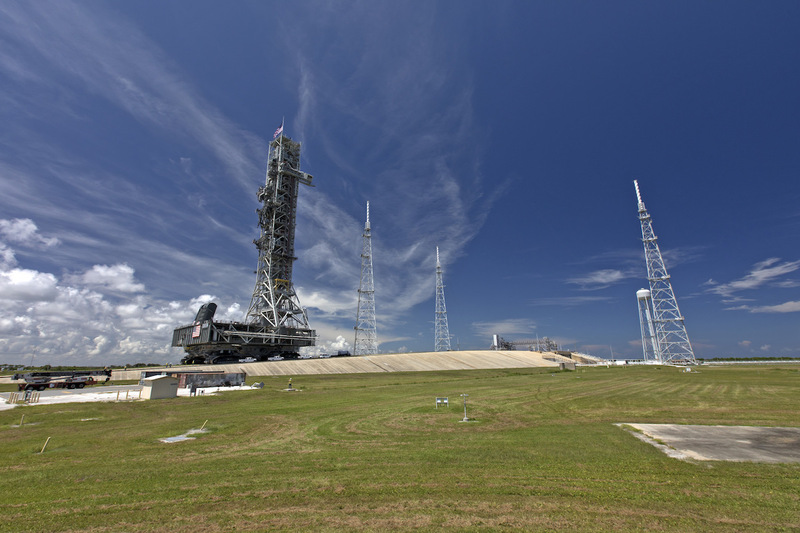 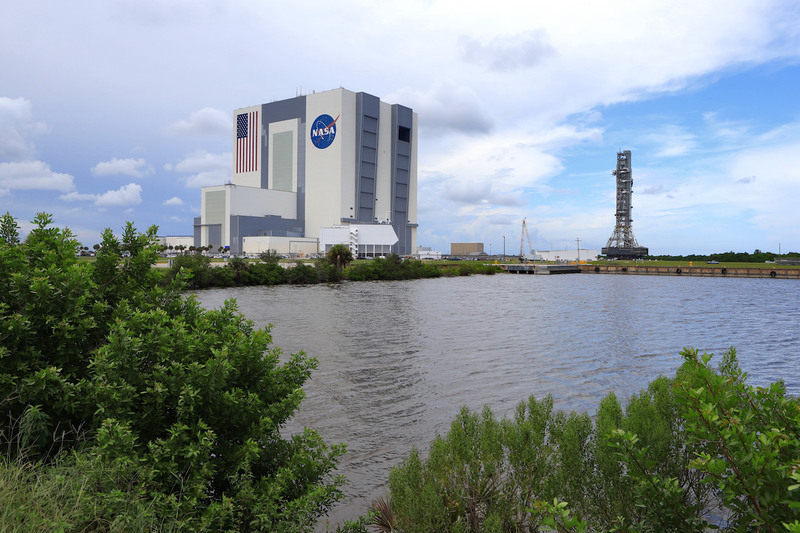 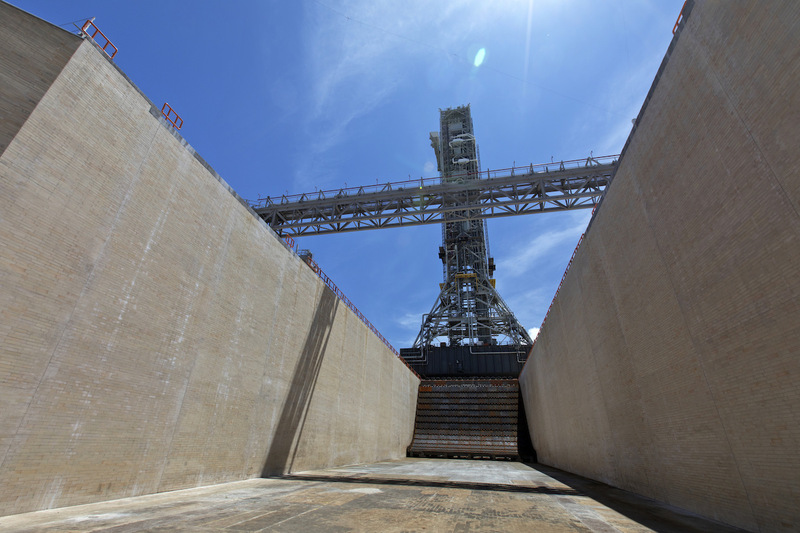 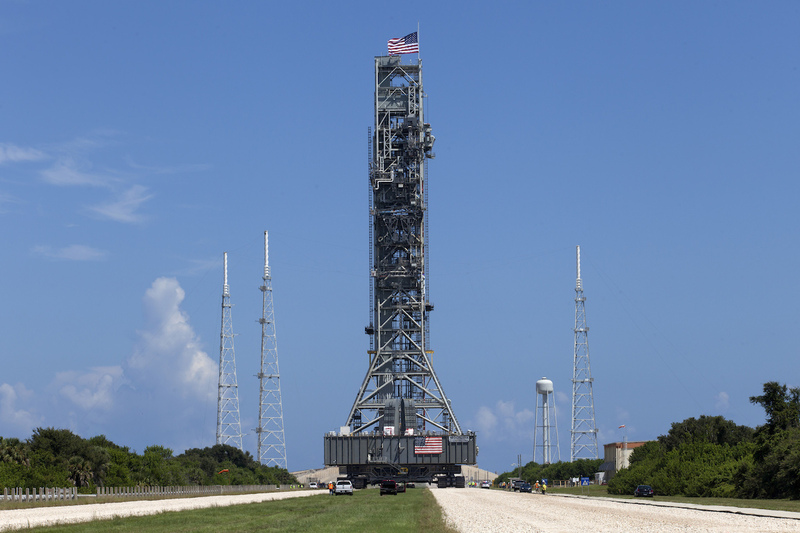 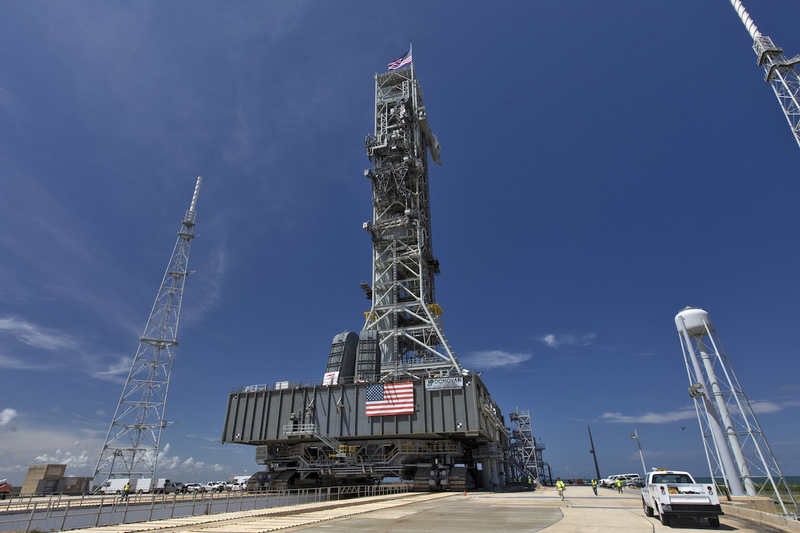 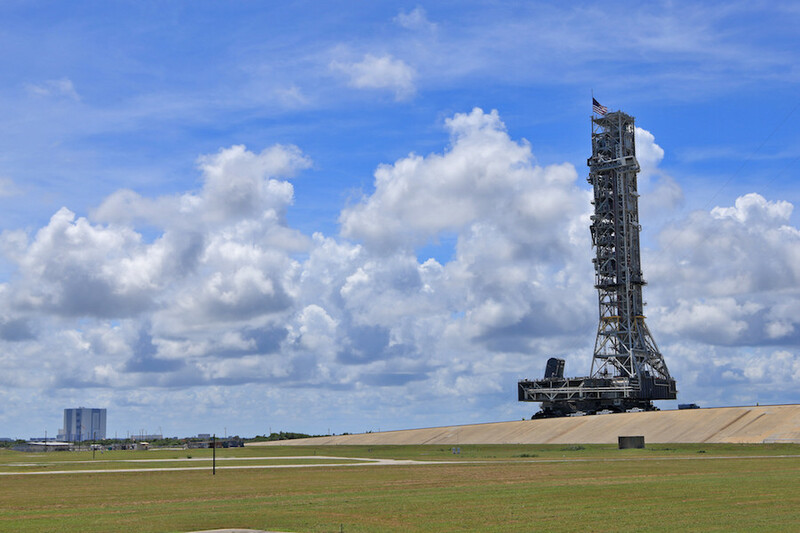 NASA announced the mobile launch platform arrived at pad 39B at 2:43 p.m. EDT (1843 GMT) as jacks on the crawler-transporter lowered the tower atop pedestals at the launch complex. 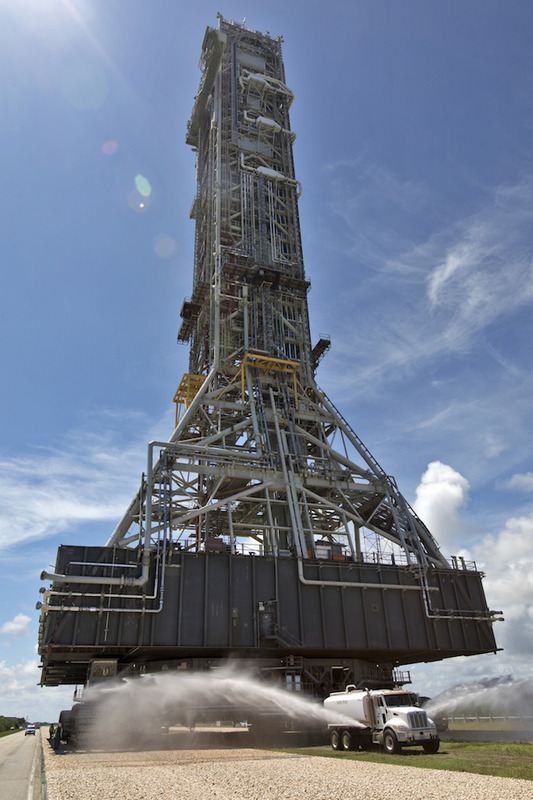 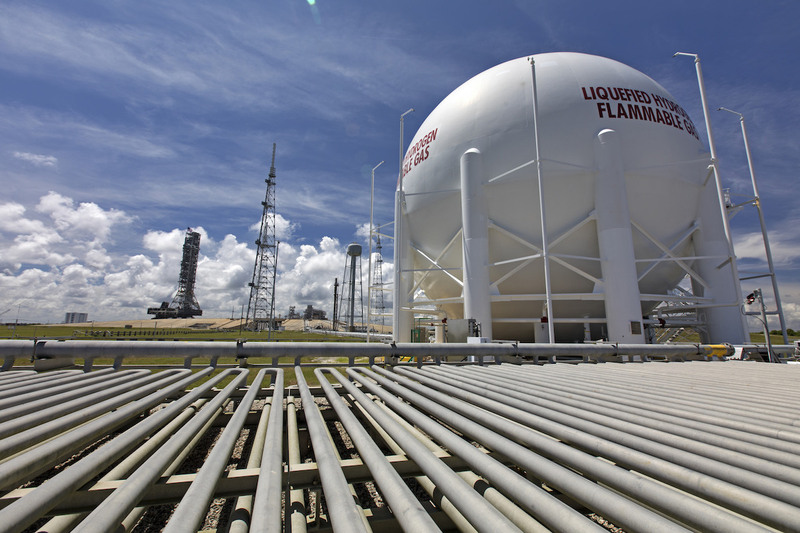 Originally built for NASA’s Ares 1 rocket, a single-booster launcher which never flew on an orbital mission before its cancellation in 2010, the mobile platform weighs approximately 10.5 million pounds. 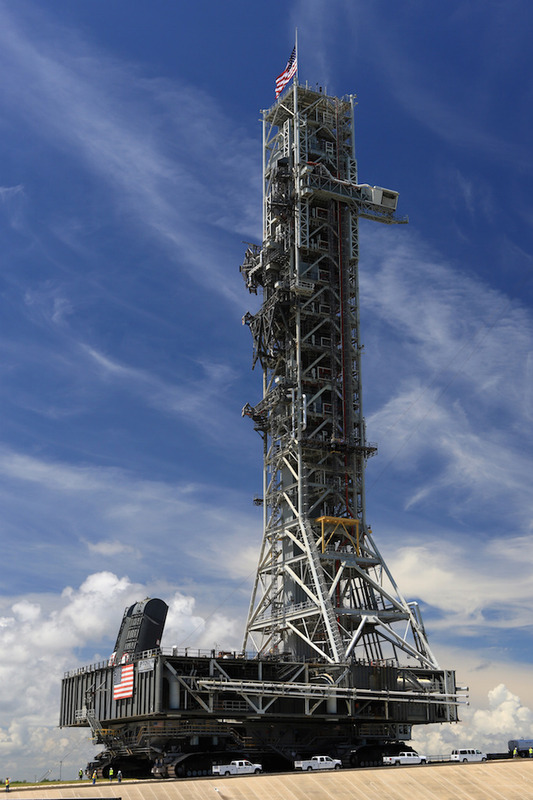 After the Ares 1 rocket was canceled with NASA’s Constellation moon program in 2010, NASA decided to modify the structure for the more powerful Space Launch System, which replaced the Ares rocket family as the launch vehicle for the space agency’s ambitions for the human exploration of deep space. 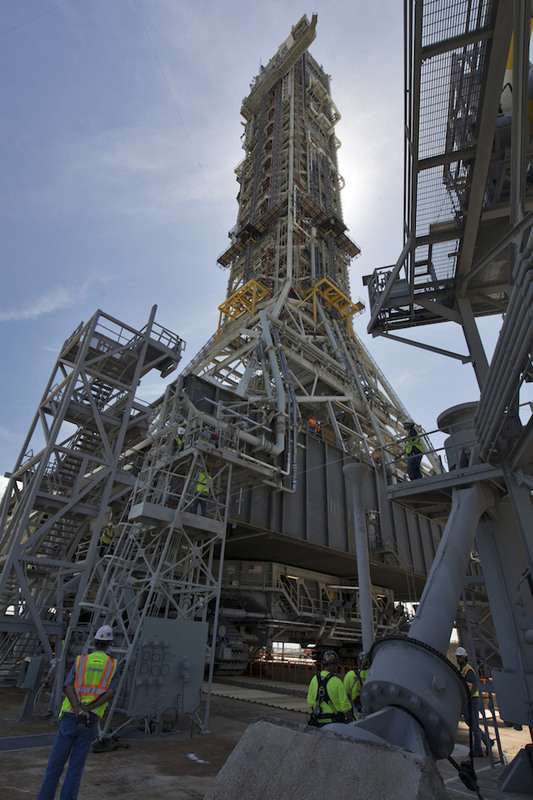 The SLS will tower more than 30 stories tall, and will become the most powerful launcher in the world once it debuts. 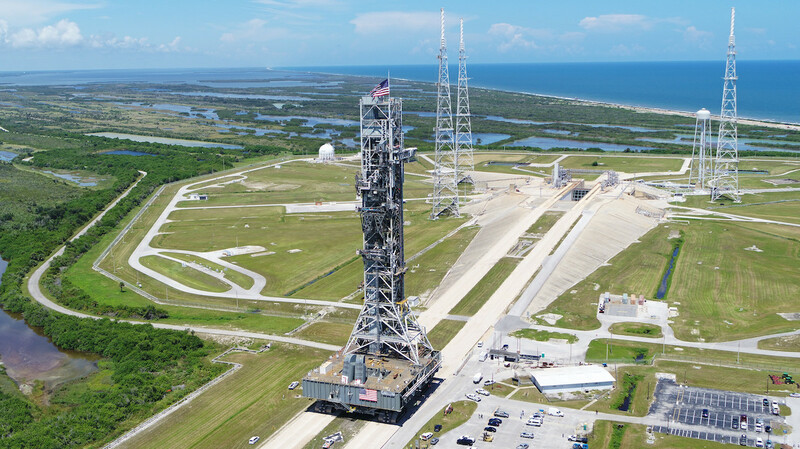 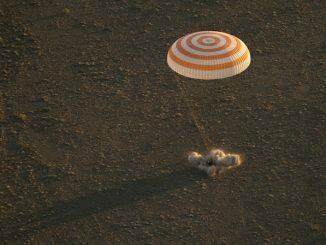 Its primary use will be to launch NASA’s Orion crew capsule, a four-person craft that will take astronauts to the vicinity of the moon, where NASA intends to construct a mini-space station in a high-altitude lunar orbit. 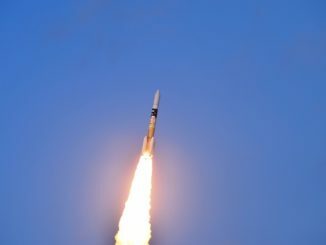 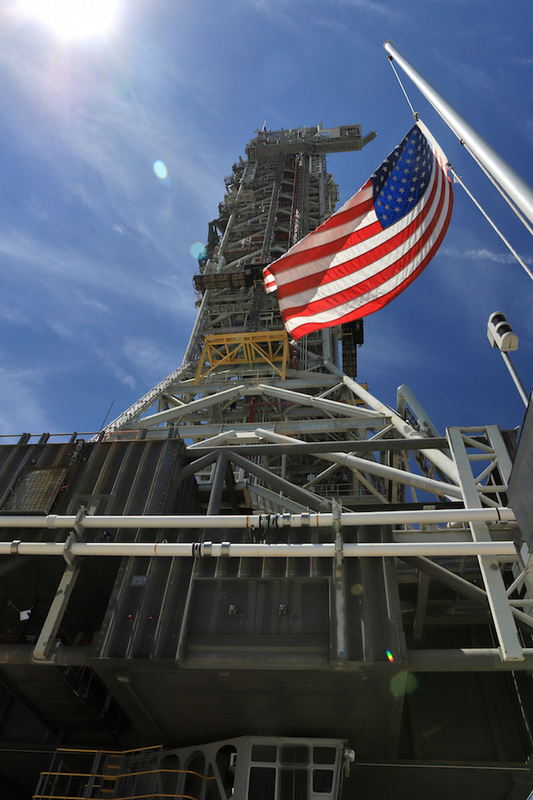 NASA plans the first launch of the Space Launch System in 2020, lofting an Orion spacecraft an uncrewed test flight to orbit around the moon and back to Earth. 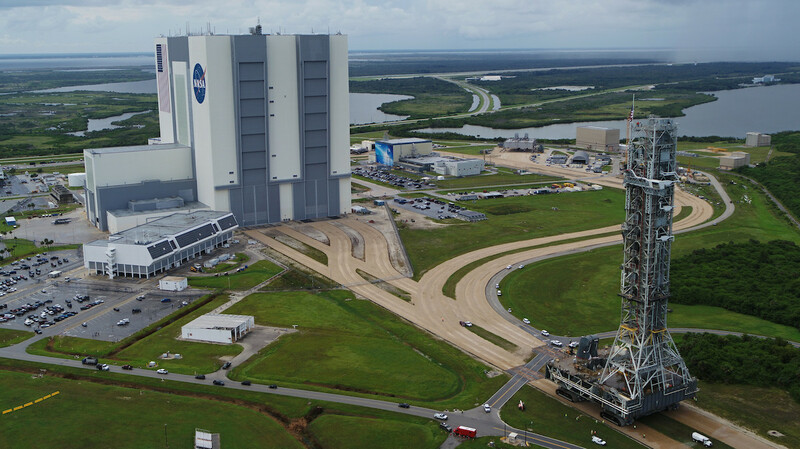 The first SLS/Orion launch with astronauts to travel around the moon and back is planned in mid-2022. 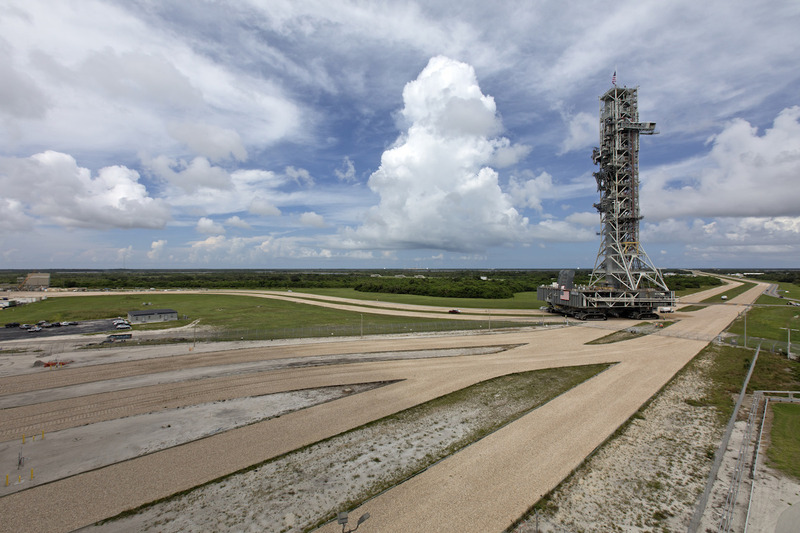 Pad 39B was originally built for the Saturn 5 moon rocket and the space shuttle program. 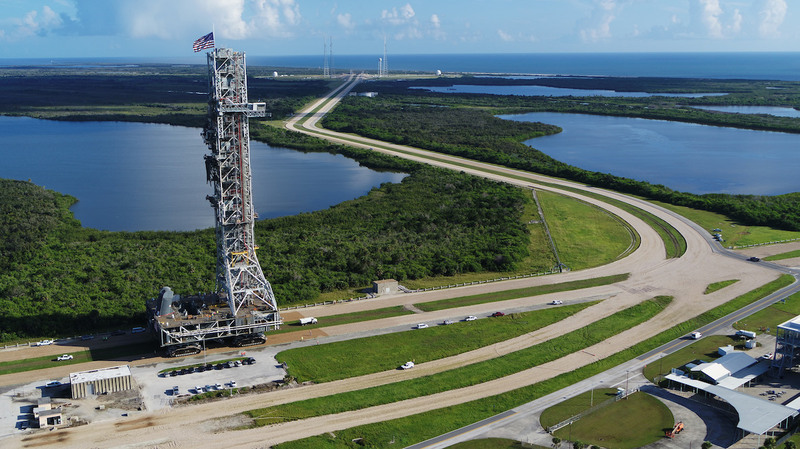 NASA demolished the shuttle-era structures at the pad, erected three lightning masts, and modified the facility as a “clean pad” without a permanent launch tower. 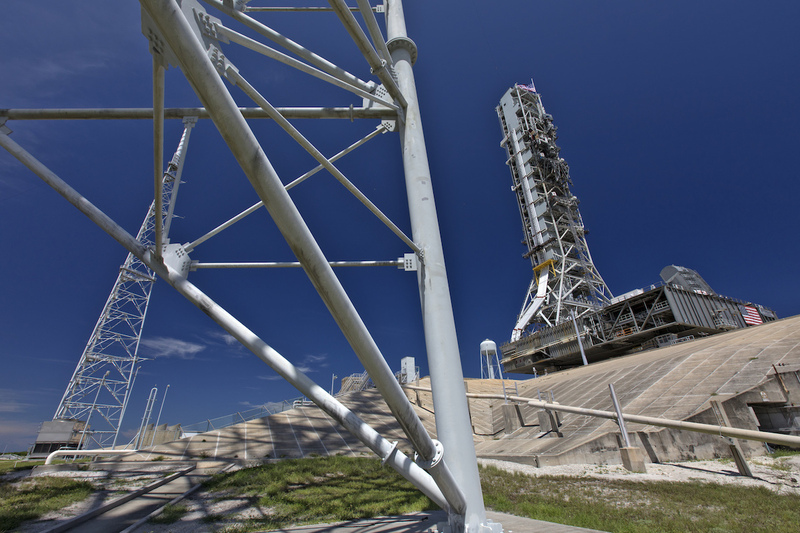 The SLS mobile launch platform will provide the umbilical connections to the rocket, including the walkway astronauts will use to board the Orion spacecraft. 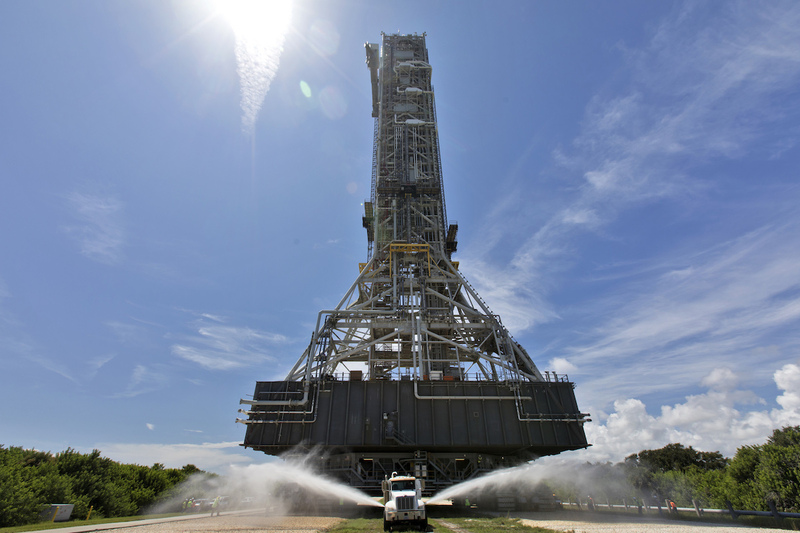 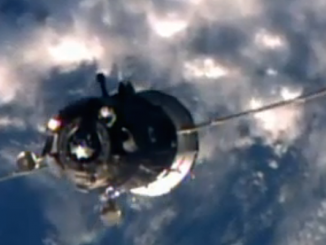 Read our earlier story for details on the rollout. 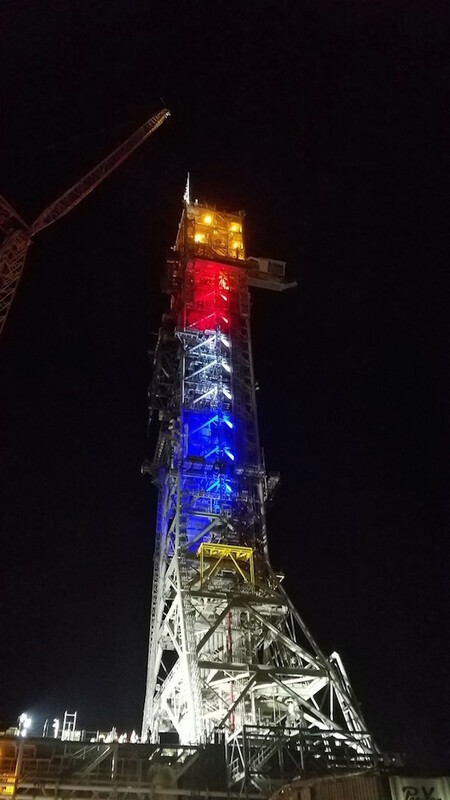 Photos of the mobile launcher’s rollout are posted below.